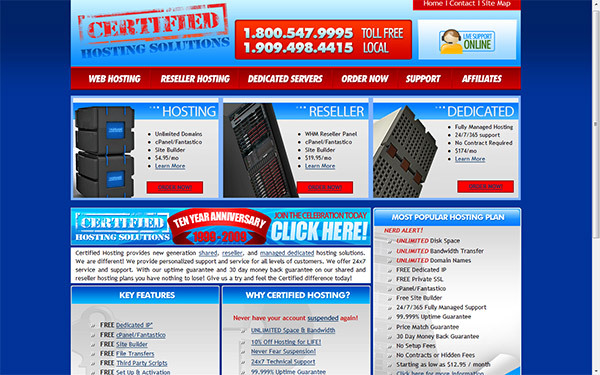 If you are on a lookout for a new affordable and reliable hosting, then you should act now to get the services of Certified Hosting and take advantage of their great promotional offers valid throughout the whole June. But don’t wait for the last moment, as you might forget and miss these great deals on Shared Web Hosting, Reseller Web Hosting and even on Dedicated Servers. I’ve been using their services for well over a year now and I can say that I’m more than satisfied by the affordability and most of all of the quality of the services they offer! You can get the Geek Plan with 2 years of unlimited Domain Hosting for only $111 (this means just $4.62 per month!) by using the promo code: GEEK11. This plan gets you a shared hosting with UNLIMITED Domain Names, UNLIMITED Disk Space and UNLIMITED Bandwidth so you can host all your websites without any worries. You can also get the Nerd Plan with unlimited bandwidth hosting only $11 per month by using the promo code: NERD11. This plan gets you a shared hosting with UNLIMITED Domain Names, UNLIMITED Disk Space and UNLIMITED Bandwidth as well as a FREE Dedicated IP and a FREE Private SSL. The Reseller Plan promotion gets you Double Space/Double Bandwidth and $11 off the price of the first monthly only. You need to use the following promo code for that to work, when signing up: RESELLER11. And if you need to get a dedicated server for your projects, then the Managed Dedicated Servers promotions will be right for you as with it you’ll receive $11 off the price every month on any managed dedicated server. This means that the Dedicated Servers start from as low as $88 per month when you enter the promo code: DEDI11 – ain’t that a good deal!